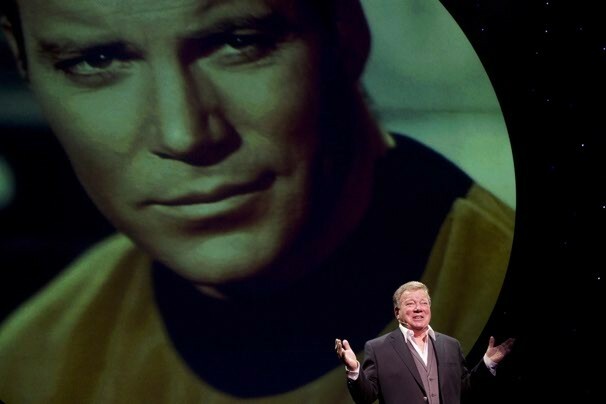 My oldest son gave me a wonderful Christmas present this year…tickets for my wife and I to see the one-man show Shatner’s World – We Just Live In It. Yes, this is the same William Shatner who starred in the iconic role of Captain James T. Kirk, captain of the U.S.S. Enterprise. The picture to the left appeared in our local newspaper and it was one of my favorite moments of the evening…seeing Captain Kirk and the man who played him together on stage…great fun! I grew up watching the original series as a kid, then continued to be a Trekker (no, it’s not “Trekkie” for those of us in the know) throughout my high school and college days as a series of six movies were created. Almost three years ago I nervously sat in a movie theater and saw J.J. Abram’s Star Trek reboot. The movie proved to be a financial success and the future looks bright for one of my favorite franchises. Now I’m anticipating the sequel to J.J. Abram’s Star Trek this May (and no, I don’t have a countdown clock on my computer). So where was I? Oh yes…in downtown Nashville just two weekends ago to see William Shatner star in his one-man act, Shatner’s World. He didn’t disappoint his fans that night. He was funny, nostalgic, and could still move around the stage with a degree of agility in spite of the fact he’s 81 years old. So why am I writing a blog post about William Shatner and his worldview? It is not to criticize a person who has played a character near and dear to my heart….I wouldn’t dare. I can remember how I felt as I sat in the theater waiting for Mr. Shatner to take the stage – at first I was excited to see him in person, I was thankful for the gift of the tickets from my son, and I was energized (no pun intended) by my fellow theater patrons who were all anticipating a great night with Mr. Shatner. But after reading his comments about aloneness, I felt a sense of heaviness, not joy. I felt sadness for the person who had played a character I’d admired all these years. I wondered how many of the thousands of people who were with us in the theater would have agreed with Mr. Shatner’s take on the world…that we enter it alone, live it alone, and die alone. You knew I’d get around to Sunday School, right? One of the reasons that my wife and I recently started a new group in our church was to “seek out new life” (yes, that is a shameless and overt Star Trek tie-in). We wanted to provide a place for people who are new to the church and new to the community to have a place to connect with others. We want to intentionally seek out new people for membership in our group. Having recently moved to Tennessee, we understand the reality of loneliness (so in that sense, Shatner is right…life can be lonely at times), and we don’t want anyone to go through life alone. Sunday School is asked to do many things in the church: be the evangelistic arm, minister to people, teach the Bible, lead people to worship, organize for caring, etc., etc., etc. But in my experience, the greatest Sunday School classes aren’t the ones with the greatest teachers…they are the ones with the greatest relationships among the people. Thankfully, I have not known the “alone in the world” life that Mr. Shatner described in the brochure. I am thankful for my current Sunday School group and for other groups my wife and I belonged to before moving to Tennessee. As I have said somewhere before, if Sunday School tries to compete for people’s attention on the basis of technology, it will lose every time; if Sunday School tries to compete based on the quality of facilities it has, it will lose. However, if Sunday School competes for people’s time and attention based on the fact it can help people connect with one another and in so doing provide a place where lonely people can find hope in Christ and find friends who’ll walk through life with them, it will win every time. God stated in Genesis that “It is not good that the man is alone…” (Genesis 2:18), so he created a partner for Adam. We also know that Jesus has promised to “never leave us or forsake us” (Duet. 31:6). God comforts us with the presence of His Holy Spirit (2 Corinthians 1:3ff) and then enables us to serve others and minister to them during times when they are alone, hurting, and in need. Most of all, because Christ lives in every believer, we are never alone! Yes, we have been created for relationship, and yes, sometimes life can take you places where you feel alone. But because of Christ and His church, people don’t have to live lonely lives. As for my wife and I, we’re going to keep plugging away at building a new Sunday School group, constantly on the lookout for lonely people who need a place to come and make friends as we all journey through life together. Do you have any William Shatners in your world who are lonely and in need of connecting to your small group? A George Gallup, Jr. survey has reported that 40% of Americans say they experience “feelings of intense loneliness.” Look for them…they are all around you. Will your group take them in? Really take them in? Previous Extreme Sunday School Challenge free downloads now available! Good word, Ken. Hope all is well with you and the new class! What a GREAT post!! Maybe there IS intelligent life down here after all!! I believe you just may have mind melded with Mr. Spock to have come up with a thing so logical and well thought out!